Improve your branch operations by up to 68% over the next three years with SD Branch solution. A majority of IT organizations are experiencing significant changes that impact the requirements for their distributed branch networks. Mobility, cloud-based applications, and Internet of Things (IoT) are altering traffic flows and increasing bandwidth requirements. 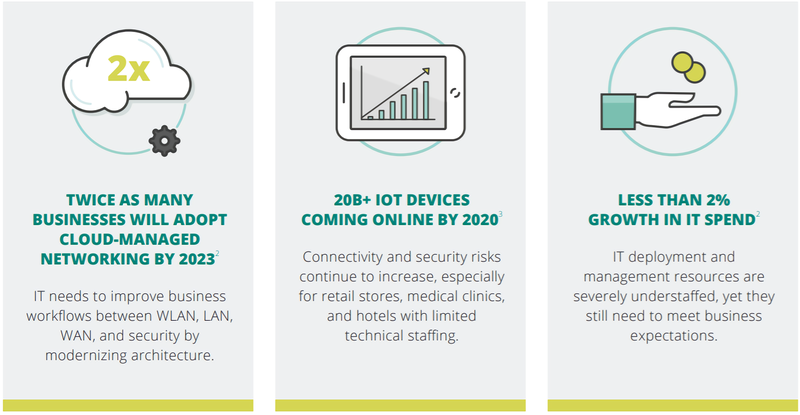 Employees and guests expect Internet connectivity, which means that employee-facing and IoT devices need reliable, low latency access to their data and applications, and must be securely on-boarded as they interact with centralized services. Adding to the problem, IT organizations are getting increasingly understaffed while still having to meet business expectations. To meet the challenges of evolving branch network requirements, IT organizations are deploying new software and cloud-based tools to optimize WAN, WLAN, and LAN. Now many people may be familiar with SD WAN, but how is it different with SD Branch? Software-defined Branch (or SD Branch) converge all network elements onto a single, easy-to-manage platform. This unified approach provides cloud management and policy enforcement to simplify WAN, WLAN, and LAN. It also introduces role-based context awareness to the WAN and integrates multiple services such as routing, firewall, and WAN optimization into one device to eliminate sprawl at the data center. 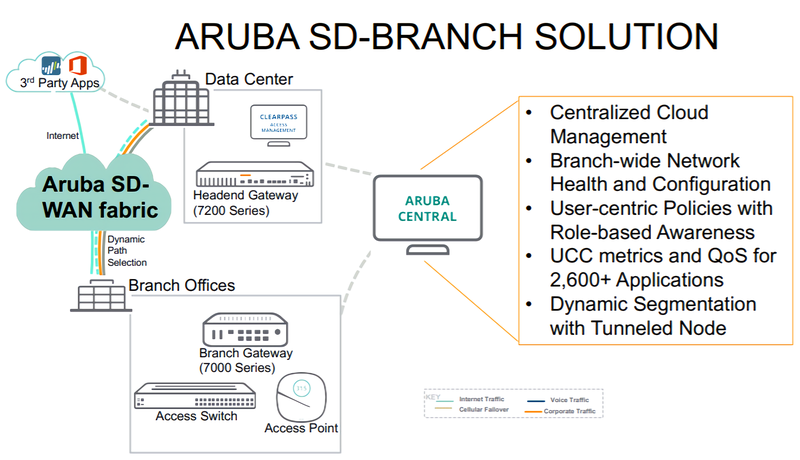 SD-Branch simplifies branch design, reduces Capital Expenses (CAPEX), and optimizes WAN utilization for greater savings than SD-WAN alone. The benefits of deploying SD-Branch solution are plenty. SD-Branch provides context awareness to optimize QoS for critical applications in the access layer and improve SD-WAN routing functionality (Dynamic Path Selection). The consolidation of network functions to software on a common platform reduces initial hardware costs (CAPEX) and ongoing maintenance fees. Cloud-based management speeds deployment and reduces complexity – thus providing operational (OPEX) benefits. With these in mind, IT organization should move towards the SD-Branch solution considering the benefits it may bring.